Dr Jochen Schweitzer and Dr Joanne Jakovich, the co-founders of U.lab at the University of Technology, Sydney (UTS), have been jointly named Best Entrepreneurial Educator in annual awards that recognise outstanding collaboration between business and higher education. The awards are made by the Business/Higher Education Round Table (B/HERT), whose members come from higher education, business, industry bodies and research institutions. Dr Schweitzer is a Senior Lecturer in Strategy and Innovation at UTS Business School and co-founder with Dr Jakovich of U.lab, an open innovation platform that brings students from multiple disciplines together to work on real-world problems. Dr Jakovich was a Senior Lecturer with the Faculty of Design, Architecture and Building at UTS and is now founding Director of SOUP Labs. 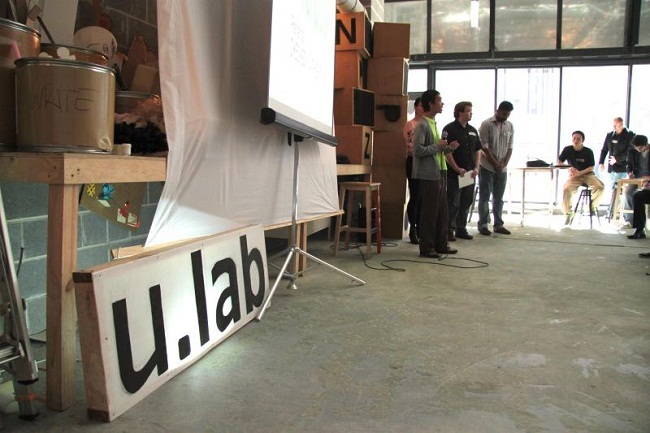 Their 2014 B/HERT award is for the Entrepreneurship Lab, a postgraduate subject for business, design, engineering and IT students at UTS which comes under the U.lab umbrella. Industry is involved in designing each semester’s Entrepreneurship Lab subject. “This is an interdisciplinary design thinking environment within which students leverage their own discipline knowledge to come up with new ways to solve components of a big-picture problem,” Dr Schweitzer says. In the lab, students work in mixed teams to apply the skills of design thinking and creative enterprise to develop solutions for real-world problems. As well as working with peers from other faculties, the students also collaborate with local entrepreneurs, communities and companies, who act as mentors as the teams develop and test prototype solutions. They use a range of tools for problem solving in the lab. “Non-design disciplines like business and IT often focus on either knowledge- or process-centred learning, frequently within rigid constraints,” Dr Jakovich says. But students in the lab are encouraged to “involve the whole person – intellect, feelings and senses”. The end goal is to develop a prototype and come up with viable business proposal to make a pitch to a panel of entrepreneurs, business experts and potential investors. Since 2011, students in the Entrepreneurship Lab have been involved in projects such as social inclusion via gamification, applications of NFC technology, sustainable tourism, collaborative workspaces and the future of retail shopping. The B/HERT award came as UTS announced the launch of a new tech precinct centred on the university and a “pre-incubator” where its students will be able to explore and nurture business ideas. Intersection: Sydney’s Digital Creative Hub is led by UTS, Microsoft and the NSW Government and aims to grow jobs in Australia’s start-up sector. The Hatchery program, starting in Semester 1 of 2015, will give students the skills to take business ideas to the next level of development, including into incubators and accelerators such as those in the digital creative hub around UTS. UTS Business School Dean Roy Green says the B/HERT award underlines the role business schools have in preparing students not only for employment but also so they can shape their own destinies and contribute to Australian business through entrepreneurial start-ups. “The Entrepreneurship Lab exemplifies the direction business education is taking, and our position as a business school in Sydney’s Digital Creative Hub,” Professor Green says. © Copyright UTS - CRICOS Provider No: 00099F - 25 November 2014 02:03 PM. The page is authorised by Deputy Vice-Chancellor and Vice-President (Corporate Services).